Myron Dustan Holcombe was born in 1882. He was the son of Byron Thompson Holcombe and Laura Eliza Dustan. Frederick William Holcombe was born in 1886. He was the son of Byron Thompson Holcombe and Laura Eliza Dustan. Bertha Laura Holcombe was born in 1892. She was the daughter of Byron Thompson Holcombe and Laura Eliza Dustan. Pansy Mary Holcombe was born in 1896. She was the daughter of Byron Thompson Holcombe and Laura Eliza Dustan. Marcia Stearns was born on 3 March 1855 at Brasher Centre, NY; (GS.) She was the daughter of Nathan Wallace Stearns and Maria Talcott. Marcia Stearns married Dr. Mahlon Beach Holcombe, son of Ephraim Holcombe and Mercy Hill, on 21 June 1881.1 Marcia Stearns died on 9 January 1912 at NY at age 56; (GS.) She was buried at Evergreen Cemetery, Keesville, Essex Co., NY. Nelson Strong Hill married Mary Holcombe, daughter of Jesse Holcombe and Mehitable Winchell, after 1840. Micha Holcombe was the son of Micha Holcombe and Hannah Hayes. Samuel Holcombe was the son of Micha Holcombe and Hannah Hayes. Horace Holcombe was the son of Micha Holcombe and Hannah Hayes. William Whiting Holcombe was born on 29 October 1847 at Windsor, Hartford Co., CT. He was the son of Hermaz Holcombe II and Emily Latham. William Whiting Holcombe married Amelia Emily Stevens circa 1866. William Whiting Holcombe married Addie E. Rising. William Whiting Holcombe married Ellen M. Fox. William Whiting Holcombe died on 8 April 1933 at New Haven, New Haven Co., CT, at age 85. William and Amelia were enumerated in the 1870 Windsor, Hartford Co., CT, federal census. He was a cigar maker, agae 22, she was 23. Children in the household were Elida 2, and Luther 4 months. William and Amelia were enumerated in the 1880 Windsor, Hartford Co., CT, federal census. He was a cigar maker, age 33, she was 36. Children in the household were Elida 12, Luther 12, Eugene 4, and William 2. William W. was enumerated in the 1900 Suffield, Hartford Co., CT, federal census. He was a cigar maker, age 50. Children in the household were William 22, a cigar maker, and Alfred 17. William and Ellen were enumerated in the 1930 Hartford, Hartford Co., CT, federal census, district 24. They were living in the household of son-in-law Herbert Wells. He was 83, she was 73. [S89] Letter, Grace B. Russell to Jr. James H. Holcombe. Amelia Emily Stevens was born on 18 December 1843 at Chester, Middlesex Co., CT. She married William Whiting Holcombe, son of Hermaz Holcombe II and Emily Latham, circa 1866. Amelia Emily Stevens died on 18 January 1888 at Suffield, Hartford Co., CT, at age 44. Addie E. Rising was born in 1853. She married William Whiting Holcombe, son of Hermaz Holcombe II and Emily Latham. Ellen M. Fox was born in 1857. She married William Whiting Holcombe, son of Hermaz Holcombe II and Emily Latham. 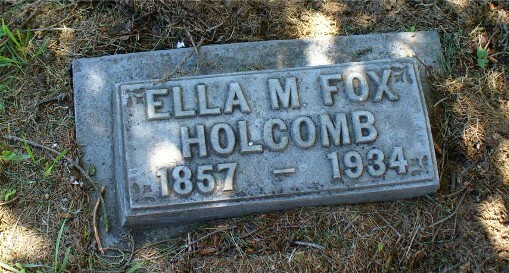 Ellen M. Fox died in 1934. She was buried at Elm Grove Cemetery, Windsor, Hartford Co., CT.
Elida Emily Holcombe was born on 20 October 1867 at Poquonock, Hartford Co., CT. She was the daughter of William Whiting Holcombe and Amelia Emily Stevens. Elida Emily Holcombe married Herbert Franklin Welles say 1887.1 Elida Emily Holcombe died on 3 June 1944 at Saybrook, Middlesex Co., CT, at age 76. She was buried at Spring Grove Cemetery, Hartford, Hartford Co., CT.
Elida and Herbert were enumerated in the 1930 Hartford, Hartford Co., CT, federal census, district 24. They were both 62. The only child in the household was Grace, 38. Additional information on Elida Emily Holcombe and her descendants is from vossj@ma.ultranet.com. Unknown Holcombe was born in 1872. Unknown Holcombe was the child of William Whiting Holcombe and Amelia Emily Stevens. Sumner Eugene Holcombe was born in 1878. He was the son of William Whiting Holcombe and Amelia Emily Stevens. William Holcombe was born in 1878. He was the son of William Whiting Holcombe and Amelia Emily Stevens. Ernest Arthur Holcombe was born on 21 September 1880 at Windsor, Hartford Co., CT. He was the son of William Whiting Holcombe and Amelia Emily Stevens. Ernest Arthur Holcombe married Mary (Maria) Louisa Braga, daughter of George H. Braga and Alice Adelia Lilley, on 11 June 1902 at Hockanum, East Hartford, CT. Ernest Arthur Holcombe died on 13 January 1940 at 39 Onyx St., New Haven, New Haven Co., CT, at age 59. The connection between the Alfred in the 1900 Census in the household of William W. and the Alfred in the 1910 census is only circumstantial. Alfred C. and Louise E. were enumerated in the 1910 New Haven, New Haven Co., CT, federal census. He was a restaurant owner, age 27, she was 22. Children in the household were Alfred 3, Luther 17 months, and Lester E. 2 months. Alfred and Louise were enumerated in the 1920 Hamden, New Haven Co., CT, federal census. He was a restaurant owner, age 37, she was 31. Children in the household were Alfred 13, Luther 10, Lester 9, and Henry 3. Mary (Maria) Louisa Braga was born on 6 October 1883 at Scranton, PA. She was the daughter of George H. Braga and Alice Adelia Lilley. Mary (Maria) Louisa Braga married Ernest Arthur Holcombe, son of William Whiting Holcombe and Amelia Emily Stevens, on 11 June 1902 at Hockanum, East Hartford, CT. Mary (Maria) Louisa Braga died on 5 March 1931 at West Lake, CT, at age 47. Alice Adelia Lilley was born in May 1860 at PA.1 She died on 5 March 1909 at age 48. Mary Louisa Holcombe was born on 8 July 1903 at CT. She was the daughter of Ernest Arthur Holcombe and Mary (Maria) Louisa Braga. Mary Louisa Holcombe married Elmer Ephram Russell, son of Ephram Joseph Russell and Marie Leonide Leona Viau, on 27 September 1923 at 1st Methodist Episcopal Church, CT. Mary Louisa Holcombe died on 11 January 1945 at New Haven Hospital, New Haven, New Haven Co., CT, at age 41. Elida A. Holcombe died young. She was born in 1905. She was the daughter of Ernest Arthur Holcombe and Mary (Maria) Louisa Braga. Ernest L. Holcombe died young. He was born in 1906. He was the son of Ernest Arthur Holcombe and Mary (Maria) Louisa Braga. Grace A. Holcombe was born in 1908. She was the daughter of Ernest Arthur Holcombe and Mary (Maria) Louisa Braga. Albert L. Holcombe died young. He was born in 1911. He was the son of Ernest Arthur Holcombe and Mary (Maria) Louisa Braga. Ernest A. Holcombe was born in 1913. He was the son of Ernest Arthur Holcombe and Mary (Maria) Louisa Braga. Albert Luther Holcombe was born on 2 April 1918 at Hartford, Hartford Co., CT. He was the son of Ernest Arthur Holcombe and Mary (Maria) Louisa Braga. Albert Luther Holcombe died on 25 January 1968 at Guilford, New Haven Co., CT, at age 49. Elmer Ephram Russell was born on 5 December 1897 at Burlington, VT. He was the son of Ephram Joseph Russell and Marie Leonide Leona Viau. Elmer Ephram Russell married Mary Louisa Holcombe, daughter of Ernest Arthur Holcombe and Mary (Maria) Louisa Braga, on 27 September 1923 at 1st Methodist Episcopal Church, CT. Elmer Ephram Russell died on 30 June 1976 at CT at age 78. Michael Arthur Russell was born in 1954. He was the son of Ernest Elmer Russell and Grace Louise Bishop.